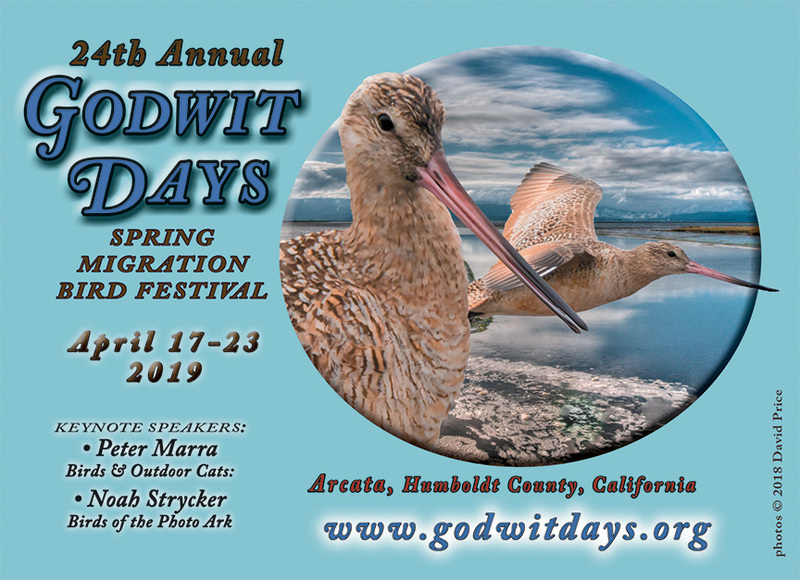 Godwit Days is an annual spring migration bird festival that celebrates the marbled godwit and all birds of Redwood Coast forests, bays, marshes, and mudflats. The festival provides a perfect opportunity to see tens of thousands of migrating shorebirds, the occasional rarity, pelagic birds, and spotted owls in the redwoods. You can learn bird calls, photograph birds at all elevations, identify dragonflies and damselflies, search for amphibians, recognize coastal flora, view children’s artwork, learn from renowned keynote presenters and numerous government and non-profit organizations, see 100+ birds on the Big Day trip and add to your life list. The festival again offers two featured speakers. On Friday night, following the free opening reception, Noah Strycker, an associate editor of Birding magazine and author of four bird books (who set a world Big Year record in 2015) will speak on “Birds of the Photo Ark.” Other sessions where you can interact with Noah include an all-day trip on Thursday to Del Norte County, a 6-hour birding trip on Saturday with a catered lunch, and a 1-hour workshop on Sunday. The Saturday night keynote speaker is Dr. Peter Marra, director of the Migratory Bird Center at the Smithsonian’s National Zoo in Washington, D.C., and author of “Cat Wars.” He will enlighten attendees about how outdoor cats have contributed to declines in wild bird populations. Other sessions where you can interact with Peter are a half-day trip to the Blue Lake cottonwoods/Mad River Fish Hatchery on Saturday, a 6-hour birding trip on Sunday with a catered lunch, and a 1-hour workshop on Sunday. All Basic Festival registrations include a keynote ticket, while the cost is just $10 for non-registrants. Trips range north to Del Norte County, south to Petrolia, and inland to Willow Creek. There are 10 new trips this year, including Avocets & Ales, Kneeland & Coastal Prairies, Bald Hills & Lyon’s Ranch Trail, Snow Camp Road & Bald Mountain, and Mammal Tracking. Many popular annual field trips will be offered, including spotted owl trips (divided according to the difficulty of the hike in to see the birds) and Shorebird Spectacle at the Marsh. The program is not limited to birds, with sessions focusing on dragonflies, reptiles and amphibians, conifers and other native plants, and dune ecology. Free events for everyone include an opening reception, Friday night lecture, presentation of the sixth annual Humboldt County Bird of the Year award, Bird Fair vendor booths, an art show, family nature crafts sponsored by Friends of the Arcata Marsh (FOAM), and some field trips (price noted as $0.00 on event list, but require sign-up to reserve a spot). All entries in the 16th Annual Student Bird Art Contest by Humboldt County students in grades K-12, which is cosponsored by FOAM and Redwood Region Audubon Society (RRAS), will be on display, with awards for it and the RRAS Children’s Nature Writing Contest presented on Saturday, April 20. Godwit Goodies: Buy & Bid! Look over Silent Auction goodies on display in the main hall. To donate, call 707-826-7050. Come into Registration to purchase 2019 Godwit Days T-shirts featuring marbled godwit photos by David Price of Laughing Frog Photography. On-site registration hours: Friday, April 19, 3 p.m. to 6:30 p.m.; Saturday, 9 a.m. to 7 p.m.; Sunday, 9 a.m. to 1 p.m. Advance registration is strongly recommended, as trips are selling out fast! Visit www.godwitdays.org.